Sunday B. Morning has always had a mystique attached to its name. What is Sunday B. Morning? Who is Sunday B. Morning? How is it that they can produce Marilyn, Flowers and Soup Cans impressions exactly like the wildly popular Andy Warhol prints of the 60s without repercussions? Let’s take a look at some facts about both Sunday B. 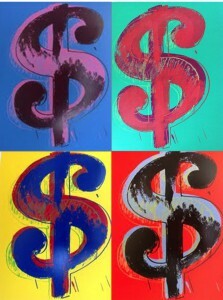 Morning and Andy Warhol prints. Andy Warhol started is career as a successful commercial illustrator and this early work formed his interest in manipulating popular images. He was also fascinated with fame and was enchanted by Marilyn Monroe. Shortly after her death he set out to pay tribute to her with his Marilyn edition prints. The Campbell’s Soup Cans and Flowers followed shortly after. The 60s were groundbreaking years in Warhol’s career. It was a time when he developed his signature style and today, the works from this period are considered his most important and are highly sought after. Andy Warhol’s Marilyn and Flower prints are 36” x 36”. They are hand pulled screenprints on heavy paper and the inks bleed to the edge with no borders. They are limited edition prints (editions of 250) published in the 60s and are often referred to as the “Factory Editions”. Since Warhol was still perfecting his printing techniques at that time, it’s hard to find one of these prints without some sort of a condition issue. Poor paper quality, using too much ink, and simply old age, all contribute to the rarity of finding these prints in excellent condition today. And get ready to open your wallet wide because a single Andy Warhol, Marilyn edition print can command well over a hundred thousand dollars, even in poor condition. The importance of these iconic impressions to the Pop Art movement cannot be overstated. 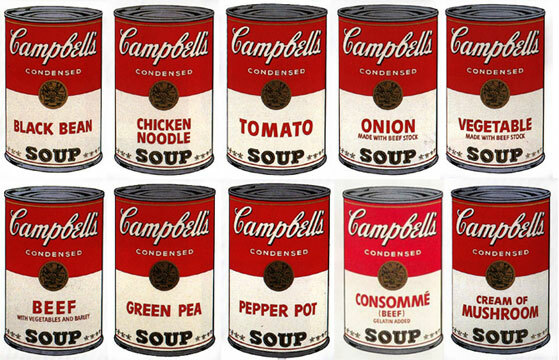 Andy Warhol once said Campbell’s Soup Cans were his favorite creation. He said of Campbell’s Tomato Soup, “I used to drink it. I used to have the same lunch every day, for 20 years, I guess, the same thing over and over again.” His earlier work in advertising inspired him, and the Campbell’s Soup Cans in particular, symbolized mass-produced, print advertising. The origin of the name “Sunday B. Morning” remains a mystery. It’s rumored that it might have derived from Sunday Belgian Morning but who knows? Much is unknown of early Sunday B. Morning. What is known is that after Andy Warhol published his famous “Factory Editions” of Marilyn, Flowers and Campbell’s Soup Cans, he began collaborating with two anonymous friends from Belgium in 1970 on a second series of prints. The original idea behind this partnership for Warhol was to play on the concept of mass production. Andy loved to comment on this phenomenon through his art. The black ink stamp “fill in your own signature” was inspired by mass production’s impact on modern culture. The thought was, ‘here we just mass-produced these prints; sign your name here. Any name will do. Because yours is as important as my own.’ The new prints were exacting in detail to the Factory Editions and so Warhol was essentially mocking the idea that the Factory Edition prints were somehow more important than these new prints. At some point, talks between Warhol and these Belgian friends began to fall apart. Maybe he had second thoughts about how this project might impact the market for his Factory Editions but no one knows the details. Regardless, it’s clear that he had a change of heart, but by this time, he had already handed over the photo negatives and the color codes used to produce the prints and the Belgians had already taken them to Belgium to begin printing. And print they did! They published editions of 250 of Marilyn, Flowers, Campbell’s Soup Cans and Campbell’s Soup Cans II. Their work looked exactly like the Factory Editions…and why wouldn’t they? These prints were created with exactly the same tools and methods Andy Warhol himself had used for the original Factory Editions. Important note: The original Sunday B. Morning editions from the 70s are noted and recognized in Andy Warhol Prints, Catalog Raisonne’ Book. 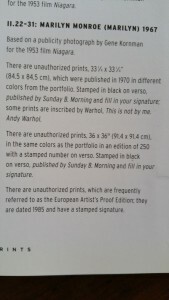 Recognition in Andy Warhol Print Raisonne’ Book. When the Sunday B. 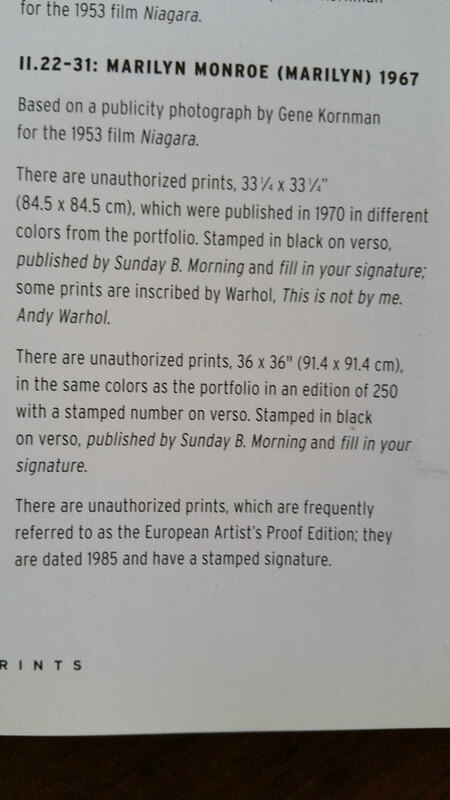 Morning editions were first released in 1970, Andy Warhol was not pleased. He had tried to stop production but could not. Because he had handed over the tools for the prints to be published, filing a suit would have been difficult. So when he periodically ran across a Sunday B. Morning print, Warhol would sign them “This is not by me. Andy Warhol” to express his ironic dissatisfaction. This of course only made the prints more sought after, especially the ones he signed in defiance. Today, the black ink Sunday B. Morning prints are very rare, as many did not survive the test of time. Sunday B. Morning began publishing the prints again, after many years, in the late 90s and they continue to publish Marilyn, Flowers, Soup Cans as well as Golden Marilyn, Mao and Dollar editions today. All these prints are also stamped – now with blue ink – on the verso with “fill in your own signature” and “published by Sunday B. Morning”. While ownership of Sunday B. Morning has changed hands a couple times, the prints are still published by the same print shop in Belgium, using the same printing process they’ve used since their inception. There are many publishers are out there who have tried to reproduce these impressions, but none come close to the integrity of a Sunday B. Morning. This is because only Sunday B. Morning possesses the photo negatives needed to create silkscreens exactly like the ones Andy Warhol used for his Factory Editions. Andy Warhol himself gave two Belgians the tools to create Sunday B. Morning, much to his later chagrin. Why he never made an attempt to challenge their use of his art work remains a mystery to this day. GinaArt is an official dealer for Sunday B. Morning prints. You can see the entire collection below and purchase from us directly. Visit our artist page and chose the “Sunday B. Morning” tab to see the complete collection. Contact us for more information or inquiry.